The Montgomery County Memorial Hospital Occupational Medicine and Health program is called Heartland Occupational Medicine. When workers are injured, it's not always easy to determine how soon they should return to work or how well they can physically handle their job tasks. A functional capacity evaluation (FCE) is a comprehensive, valid, reliable tool that will help answer these questions. Through the FCE, a physical or occupational therapist works in conjunction with the referring physician. The result is an accurate and objective assessment of what tasks your worker is physically capable of performing any limitations they have as a result of an injury. Create accurate lifting restrictions and estimates. Compare the employee's physical capabilities to their job description to determine whether they are ready to resume their duties. Determine if further medical treatment is needed. Provide support for the physician in assessing. The results of the FCE concisely communicate recommendations for your employee's current and future work status with evidence that is legally defensible and admissible in court. As a result, the FCE can help facilitate your employee's return to work, close the case faster and reduce the total claim expenses. Avoid work-related injuries by making certain your employee can safely meet the physical demands of the job. To assist you in evaluating new employees and monitoring the health of your workers, Heartland Occupational Medicine provides a variety of post-offer and periodic physical examinations. The post-offer examination provides a general health assessment of the employee, identifying conditions which could prohibit them from safely performing their job. 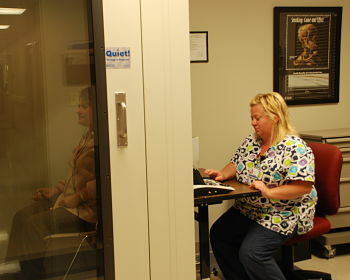 The exam can also be expanded by adding functional screens within the clinic and/or rehabilitation services. This measures your employee's ability to perform the essential functions of the job for which they have been hired. For instance, if the employee must be capable of lifting 50 pounds from the floor to shoulder level 20 times per day, a post-offer test can be developed which determines their ability to perform that task. Our therapists are available to assist you in developing appropriate job descriptions, training employees in proper body mechanics, analyzing and altering jobs which may result in injuries, and a variety of related services. Heartland Occupational Medicine can assist you in providing a safer workplace by screening new applicants, and identifying current employees who abuse drugs or alcohol through post-accident, random, for-cause and periodic testing. We use a certified reference laboratory to provide accurate and timely urine drug screen results, or we can use the lab of your choice. A variety of urine screens are available to test for the most common drugs of abuse. A medical review officer (MRO) who reviews results to determine whether the screen represents an appropriate use of prescription or over-the-counter medication is also available. Staff members are certified to perform DOT collections 24 hours a day. In addition, we offer state-of-the-art Evidential Breath Alcohol Testing (EBAT), which instantly determines whether an employee has been using alcohol. The test can be conducted at random, following an accident, for-cause, or periodically as directed by the employer. The EBAT equipment meets the standards established by the United States Department of Transportation for commercial drivers. 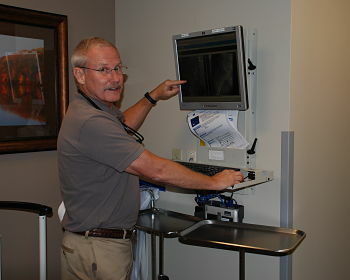 Heartland Occupational Medicine is designed to meet the unique needs of employers by offering access to injury care, physical examinations and substance abuse testing services in one convenient location. We can assist you in developing a comprehensive approach to employee health, including an appropriate substance abuse testing policy. When work-related injuries occur, you can count on the professionals at Heartland Occupational Medicine to provide the services you need. Because we specialize in occupational health, our staff understands the unique challenges of the workers' compensation system. We are dedicated to providing timely and appropriate communication regarding the work status of each injured employee through a special Work Status Report form following every patient visit. We also provide a comprehensive injury management program to assist you in returning the employee to work safely and as quickly as possible. This program is designed to keep you and your claims adjuster informed of each patient's progress while explaining the services being provided. As the area's largest employer, Montgomery County Memorial Hospital recognizes the need to maintain a healthy and productive workforce. Heartland Occupational Medicine was developed with that goal in mind for your employee and ours. 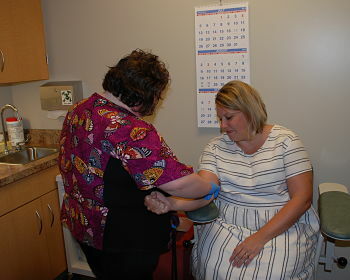 Heartland Occupational Medicine clinic hours are Monday through Thursday, 8:30 a.m. to 4:30 p.m. During the hours when the Heartland Occupational Medicine clinics are not available, injured workers presenting to the ED will receive injury and related care, such as drug screens, according to the protocols established between your organization and the clinic. As a component of the injury management program, the care coordinator from Heartland Occupational Medicine will follow up on each employee visit to the ED, notifying the employer of the patient's status and coordinating any required follow-up care. Heartland Occupational Medicine can offer many educational and motivational programs, including stress management, weight control, smoking cessation, nutrition, early cancer detection, exercise, relaxation and proper body mechanics. Our staff has experience in helping your employees start taking the steps to better health. We use proven methods to produce the best results and hope you take advantage of the unique opportunities to give your business the competitive edge.